To start, if you haven't already done so run the script in the above folder to generate the MAM database (not for commercial use or copying). You'll need to import (deep breath) the Animal, Centre, Pos, Product, Quadrant, Region, Species, Store, Town and Transaction tables. 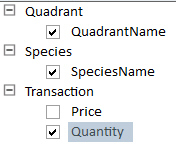 This pivot tables shows total quantities sold by quadrant and species. The start of the error message. This is what your new column should look like. The figures to watch are those for reptiles, since this species includes snakes (0 legs) and crocodiles (4 legs). When you've got this working, save the workbook as Four legs good (you may well need it again soon! ), and close it down.